Yes, a mini update. 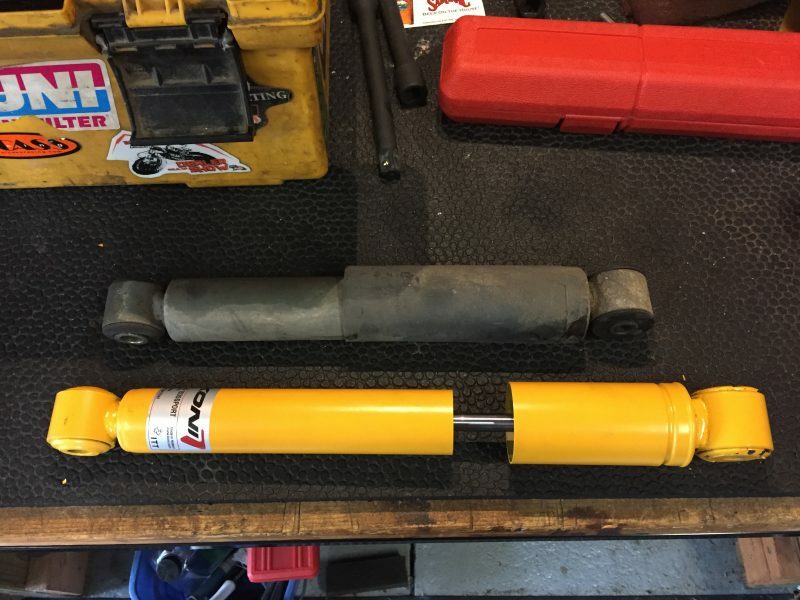 For some reason, I expected replacing the rear shocks on Project 944 GTS would be a more time consuming job than it wound up being. Instead, replacing the rear shocks with Konis on this Porsche was easier than changing the oil. The improvement in performance and ride quality from this simple change was pretty incredible given how straightforward the change was. Here is the breakdown of how to make the swap, with a little insight into the minor comedy of errors that occurred as I was working. Before we get started with this post, we need to thank Michelin. As many of you know, Michelin is a long-time sponsor of FLATSIXES.com. Recently, they have generously offered to sponsor Project 944 GTS as part of their involvement with our site. Please consider checking out what Michelin has to offer by clicking their banners on this page. Without Michelin's support, and others like them, this site really wouldn't be possible. Maybe it's just my age, but I'm simply not used to cars where I can change shocks without dealing with compressing a coil spring. Because the rear of the 944 features torsion bars, as well as effective limiters on the travel of the trailing arm, removing the shock is very straightforward. 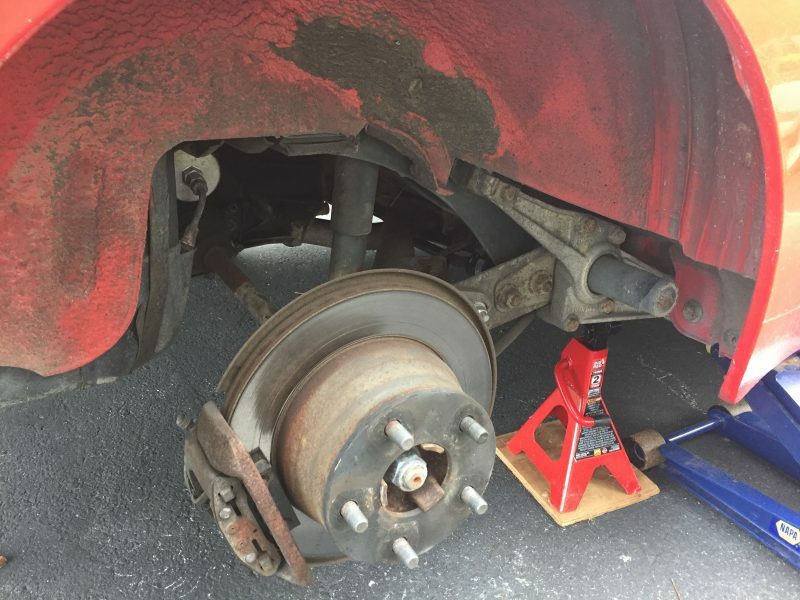 Jack the car up, remove the wheel, set a jack stand under the end of the trailing arm and locate your mounting bolts. In my case, the upper bolt on both sides had some undercoating over it, which had to be scraped off the bolt head. 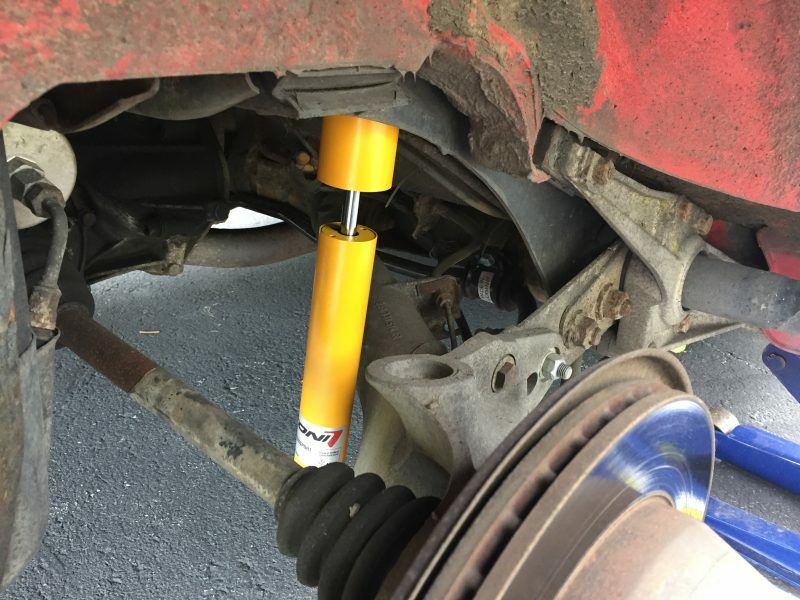 I found it useful to have two jackstands handy- one for my safety in case the jack failed, and a second to place under the end of the trailing arm to help compress the arm and install the new shock. Once you scrape any undercoating off the upper bolt, it is easily removed with a 19mm socket and a 19mm box wrench for the inner nut. The lower bolt fits into a threaded receiver in the lower control arm. 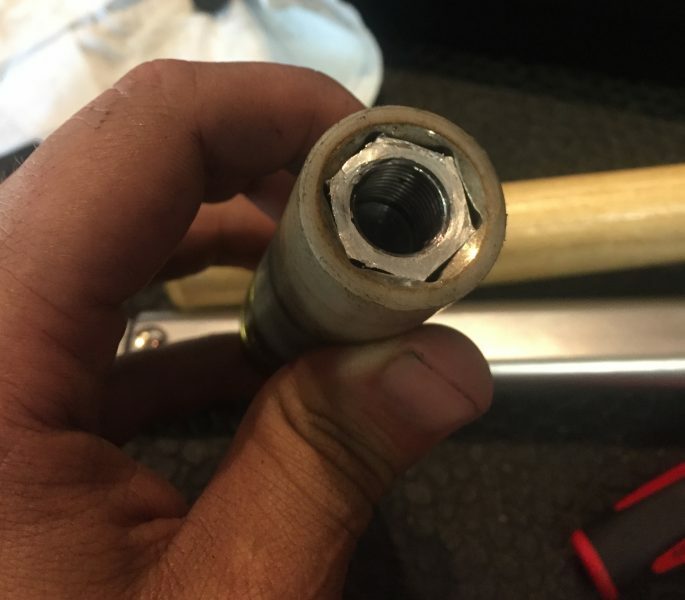 This bolt is easily removed with a 21mm socket. Upon removing the shocks, I discovered the rear shocks were likely to be original to the car. While the front shocks are currently newer Sachs Super Tourings, the rear shocks carry Porsche part numbers. The left shock was in fairly good shape, but the right had leaked severely. On compression the two shocks felt similar, but the right shock would not rebound. As Koni shocks are adjustable, there are a few steps to take to ensure that the shocks are set up the same left and right. The shocks have internal bump stops within the dust jackets. 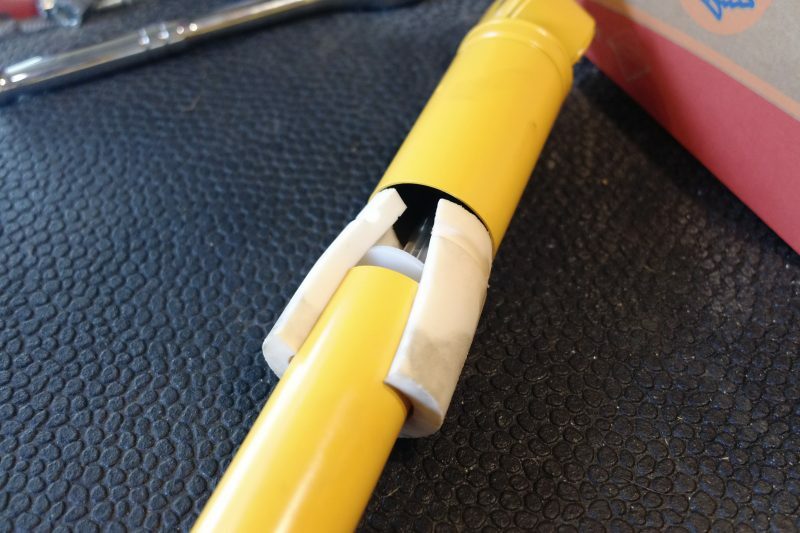 To remove it, extend the shock fully, and use a slim screwdriver or a long awl to draw the bump stop out. If you do not remove the bump stop, the shock cannot be compressed fully and adjusted. The actual adjustment can be done with the shocks on the car, though I opted to do it on the work bench. Using a bench vice with padded jaws I clamped the top end of the shock securely. To engage the adjuster, simply compress the shock fully, and turn clockwise for a stiffer setting or anti-clockwise for softer damping. I adjusted both shocks first to full stiffness, and backed each off two clicks on the adjuster cam to ensure uniformity. Reinstallation is the reverse of installation, with one extra step. 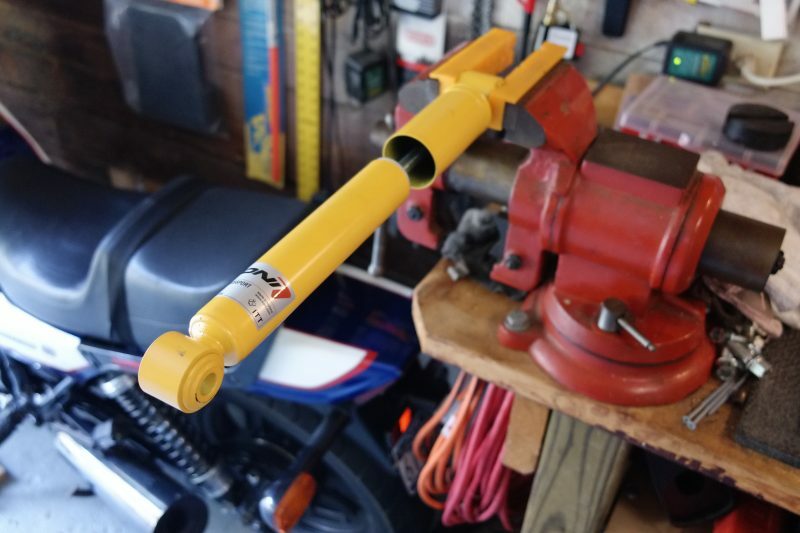 As the trailing arm will drop about an inch after removing the shock, the torsion bar will need to be compressed slightly to make the mount holes line up. 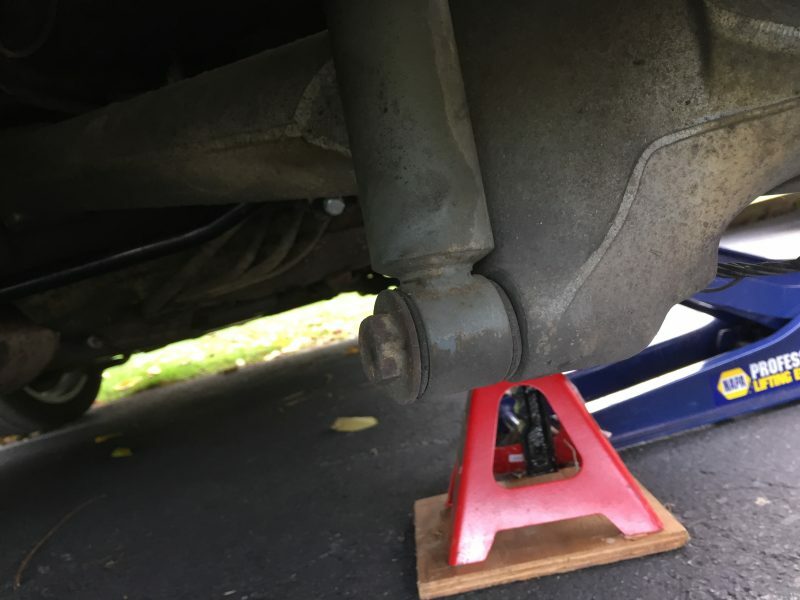 I found the simplest method was to place a jack stand under the end of the trailing arm, and gently lower the jack arm until the trailing arm rises about an inch. 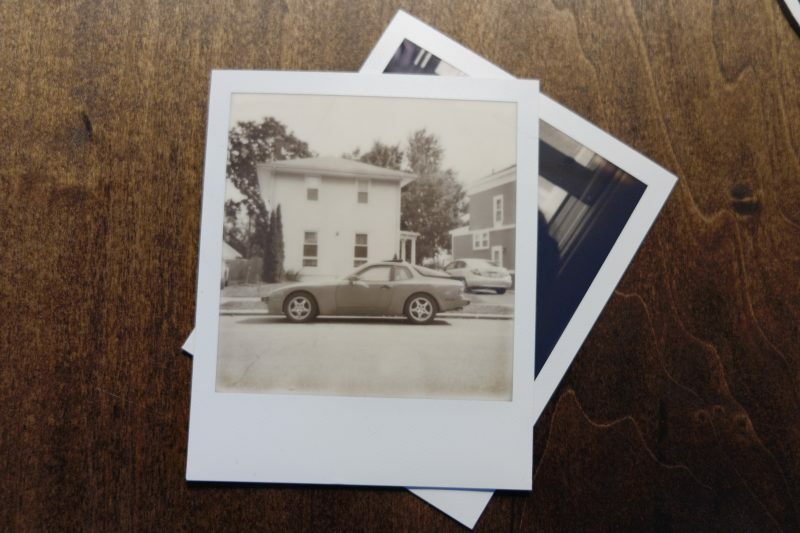 If you're planning on writing a blog post, the first step is to make sure you have a memory card in your primary camera. Fortunately, that issue is specific to me, and I was fortunate enough to have my DXO One camera also in my bag. The DxO is a handy little piece of equipment we were provided by DxO through our friends at Michelin, and is a high resolution camera which uses the iPhone for its UI. The larger item that can go wrong concerns Porsche's aluminum lug nuts. Since I got my last set of tires recently, I've only had to remove two wheels from the car; the left rear was removed to install the short shifter, and the left front was removed for a minor puncture. It turns out either I, or my tire shop, needs to stop working out. As I went to remove the right rear wheel, I removed two lugs normally, and as I went to remove the third I felt a discouraging metallic tink through my breaker bar. 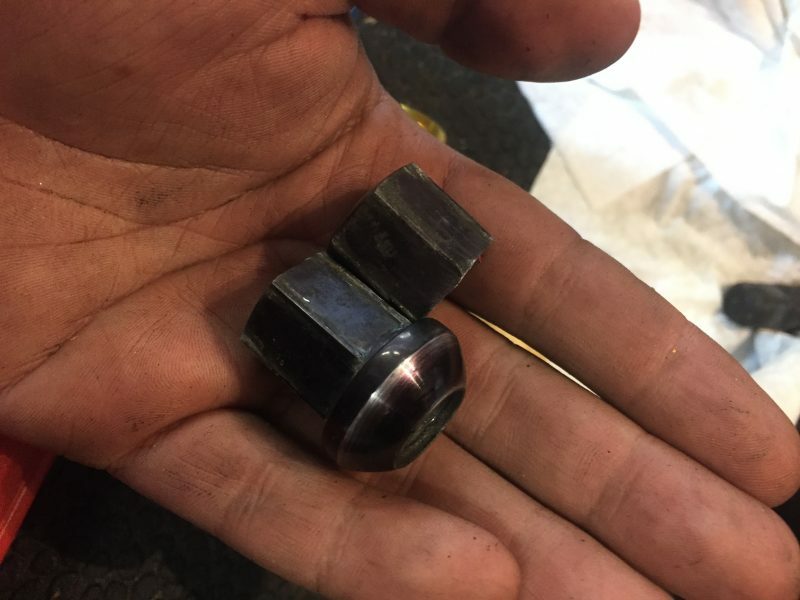 The lug broke off right where the hex head of the nut met the shouldered lower half of the nut. I checked the remaining nuts on the right side of the car with a Tekton torque wrench. I found that about half were torqued roughly correctly(~85 ft-lbs of torque), and the rest were torqued well beyond 100 ft-lbs. This is well beyond the tolerance of Porsche's lightweight aluminum lugs. Of course, this setback meant that the stud had to be drilled out. I didn't have an appropriately sized metal bit handy, which meant taking the car to my mechanic around 25-miles away to drill the stud out. So, PSA, always ensure your lugs are torqued correctly. Fortunately for me, this happened in my driveway, not on the side of the road while dealing with a flat. The combination of the upgraded sway bars and rear Konis make my Porsche feel drastically tighter, though not necessarily more controlled. I am still working with the rear adjustments to make the 944 a little more neutral, as at present the car is slightly more tail happy than I would prefer. Thanks to the 944's high polar moment of inertia, once the car starts to rotate it generally wants to continue to rotate, which can be fun though not necessarily fast. As currently adjusted, the damping on the Konis doesn't make me feel that I will want to run a higher spring rate right away. After replacing the shocks my girlfriend and I took the car up to the Lake Placid area for a short trip, and the present damping and spring rates are very well suited to spirited road driving. Even on poor pavement the car feels composed, and isn't easily unsettled by midcorner bumps. On long highway stretches the ride is quite good, and well suited to the car's role as a mini-GT. 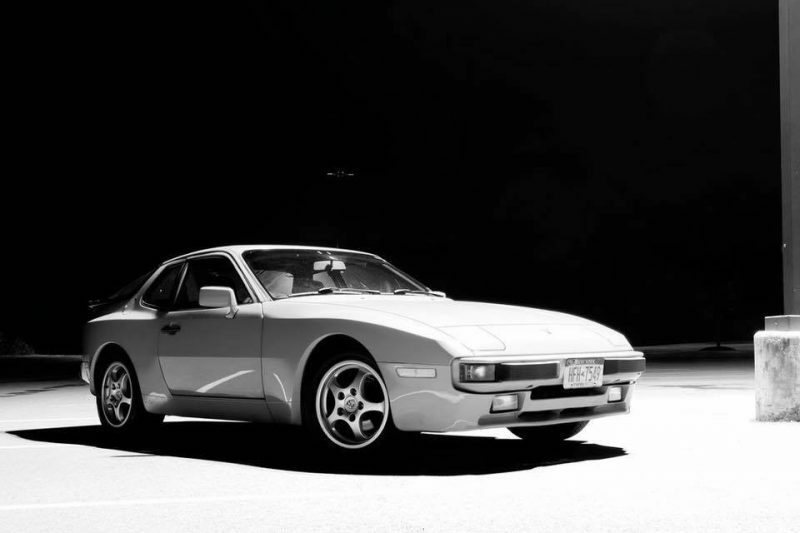 Where the 944 is still let down is chassis stiffness. There is no way around it, the 944 structure is old, and has a lot of large holes in it. Trying to find ways to stiffen the structure slightly without compromising interior space is next on the list. We like driving this car, and while a welded in roll bar would improve rigidity, I am less enthused about its potential for intruding on cabin space, as well as safety, for helmet-less passengers. If you have any suggestions regarding how to improve performance in this area, please let me know! *We have an affiliation with Amazon. If you purchase something seen on our site, using a link we provide, we get money to help keep our Porsches on the road. Please know we would never link to something we haven't used ourselves and think worthy of a recommendation. So my intended question is about how are you going to work on your steering feel? The bar bolts directly into the rear seat belt mounting points, and fit perfectly. Installation took about 20 minutes and the whole process is completely reversible. The bar is not inexpensive, but at ~ $600 will not break the bank. It is very stout, extremely well made, and can be painted to any color. Mike, I’d not seen that particular product before. Very cool. How is the clearance on the upper bar relative to your head? I’m always concerned about cages(or anything cage-like) in street cars, especially one like mine that is driven nearly every day for much of the year. It looks like a well engineered piece, I just don’t want to commit to making my girlfriend wear a helmet to dinner out of fear of a traumatic brain injury. If there’s plenty of clearance, awesome, and it’s definitely worth considering. Because of the big hole in the car for the hatch, this is pretty much exactly the part of the car that would benefit most from extra stiffening! Chris – the top bar sits nearly flush with the roof, and well behind the headrest. In fact the bar is just to the rear of the sunroof opening, so there is no possible conflict for someone sitting in the front seat. It does make sitting in the back seats impossible, but it pretty much is anyway! Whatever happened to this? If love to continue following it. I would love to hear an update as well!